Here's something I've been wanting to see for the longest time. Do you recall the Binatone Readme Mobile that I showed you a few months back? 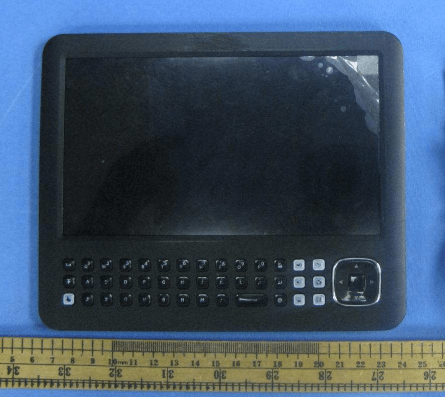 That model never showed up on the market in the UK, but today I learned that someone sent similar hardware through the FCC. We might see it on the US market before long. This is an Android tablet that could charitably be called a Kindle Clone. But if you ask me, it is a clone that was designed by a blind man working from a vague description of the Kindle. Never the less, I want one. This model looks to be the same hardware as the Readme Mobile. It's based on a 7" (800x480) screen, and it's running Android v2.1 on a Rockchip 2918 CPU. Like the Readme Mobile, the WR780 has Wifi (g), SD card slot, a speaker, and a qwerty keyboard. It's not clear how much Flash storage that it will ship with, though. It's not completely clear from the manual, but I'm also pretty sure that this tablet has a touchscreen (unlike the Readme Mobile) as well as the keyboard. The internal photos show 2 cables for the screen, and the only reason I can think of is a touchscreen. The user manual shows a bog-standard Android install, and it also mentions that the WR780 will ship with decent video and audio support as well as a limited amount of apps. There's nothing fancy here, just the basic browser email, file manager, and so on. But it is also shipping with a reading app and the app does support Adobe DE DRM. I cannot see a sign of an app store so you'll likely need to install one for yourself or go looking for apps the old-fashioned way. But since this runs Android v2.1 that shouldn't be much of a problem. I might make fun, but I really do want to see this device. It's the first device I've seen in a long while that actually did something unusual. The Kindle Touch looks like the Nook Touch looks like the Kobo Touch. The iriver Story is a pretty obvious Kindle clone itself. What can I say, I'm getting bored. There's no word yet on who will be selling this, but I can say that I saw it in a booth at CES 2011. I'm still waiting to hear back from the company and my phalanges are crossed that they will release it this year. Touchscreen and a full keyboard to boot is how I like it. Nothing about the price though. Wait and see.